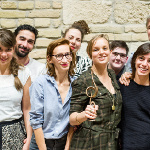 WOMEX 15 - WOMEX Wins Hungarian Award! Some great news: WOMEX 15, which was held in Budapest, Hungary, has been awarded the Artisjus Award from Best Popular Music Event of the Year! The Artisjus Awards are held by the Hungarian collecting society and are some of the most prestigious music awards in the country. We're very proud to have been recognised with this award, and we want to thank our WOMEX 15 local partners Hangvető for all the hard work they put in. Now we're looking forward to WOMEX 16 even more!